Wall Street analysts are already slashing their earnings growth estimate for 2019 to only single digits, according to FactSet. Economist Ed Yardeni curbs his enthusiasm for the earnings outlook, projecting growth of just 5 percent next year. The S&P 500 has fallen 12 percent in the past three months, wiping out its gains in 2018. No matter what you believe is driving the stock market in the short term — the Federal Reserve, a trade war, Trump's Twitter — the value of stock prices over time ultimately will come down to earnings. And that means the future is only getting bleaker from here. Wall Street analysts are already slashing their earnings estimates for 2019 to just single-digit growth, a big slowdown from the record 21 percent earnings growth expected when 2018 is all said and done, according to FactSet. Economist Ed Yardeni also curbed his enthusiasm for the earnings outlook, projecting profit growth of just 5 percent next year. "The problem...is that comps are going to be tough in the coming year following this year's earnings," Yardeni of Yardeni Research said in a note to clients Wednesday. "Earnings growth at best should be in the low single digits next year, not the high single digits as analysts still expect. Investors perceive that the risk is on the downside if the trade war persists next year, if global economic growth slows, and if profit margins get squeezed." It's no secret that earnings are the long-term driver of stock prices, which had been trending upward until recently when recession fears crept in. The epic earnings growth in 2018 was largely boosted by pro-business policies including tax cuts, whose impact can fade relatively quickly. 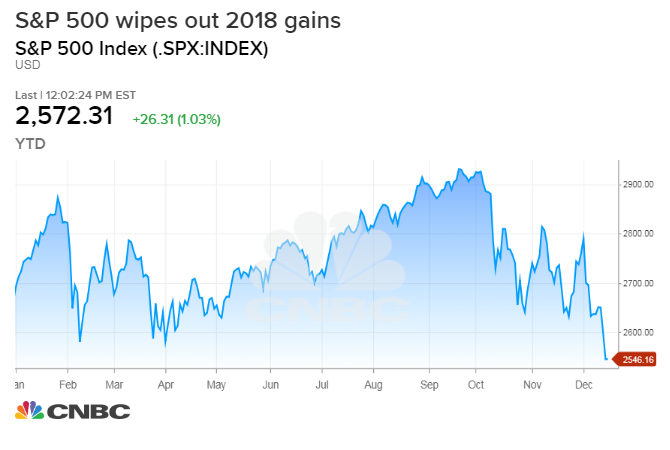 The S&P 500 has fallen 12 percent in the past three months, wiping out its gains in 2018. For 2019, company analysts are projecting earnings growth of 8.3 percent and revenue growth of 5.5 percent, compared with 2018's earnings growth of 20.5 percent and revenue growth of 8.9 percent, according to FactSet. On a per-share basis, the earnings estimates normally get reduced further quarterly by a five-year average of 3 percent. So that means growth could be as low as 5 percent. Morgan Stanley's chief U.S. equity strategist, Michael Wilson, who called the sluggish equity market this year, is seeing a 50 percent chance of an earnings recession in 2019. An earnings recession is often defined as two consecutive quarters during which S&P 500 earnings decline on a year-over-year basis. "With decelerating top line and building cost pressures, we are highly confident that earnings growth will be below consensus expectations next year and believe there is elevated risk of an outright earnings recession," Wilson said, adding that "tax is truly a one-time effect." To be sure, the market may already be pricing in this profit slowdown as evidenced in a severe drop in valuation multiples. The forward price-earnings for the S&P 500 fell to 14.62 on Wednesday, the lowest level since October 2014. "The latest correction seems to be discounting the possibility that earnings growth will be flat to down next year. We are still expecting revenues and earnings to grow next year because we aren't in the recession camp. It's just that we foresee slower growth than analysts are expecting, and their expectations are very likely to come down to our numbers," Yardeni said.